Nobody wants a stressed-out baby. The stress is contagious, and chronic stress has long-term health consequences. When babies are exposed to high levels of the stress hormone, cortisol, they are more likely to develop behavior problems and stress-related diseases later in life (Asok et al 2013; Luby et al 2013). In the worst case scenario, toxic stress can alter brain growth and shorten the lifespan. But there is good news for parents feeling the strain: We can do a lot to protect babies from the effects of toxic stress. For example, experiments on nonhuman animals show that infants exposed to lots of nurturing touch are more likely to develop into stress-resilient adults – even if they were born with risk factors for stress-related problems (Meaney 2001). And the same seems to be true for human beings. When Helen Sharp and her colleagues tracked the development of babies at high risk for developing stress-related problems, the researchers found evidence for the protective power of physical affection: High-risk babies developed normally if their mothers gave them many cuddles and caresses during early infancy (Sharp et al 2012; Sharp et al 2014). Other research attests to the power of parental sensitivity and responsiveness – the ability to “read" a baby’s cues and give him what he needs in a timely way. For instance, parents who show higher levels of sensitivity tend to have babies with lower baseline cortisol levels (Blair et al 2006). And it's the infants born with “difficult," easily-distressed temperaments that seem to benefit the most. In studies tracking children over the long term, such babies have ended up with better outcomes than their more laid-back peers – if they were raised by sensitive, responsive parents (Stright et al 2008; Pluess and Belsky 2010). So parenting makes a difference. But how does it work? And what can parents do to become more attuned, stress-savvy caregivers? Here are some evidence-based pointers. 1. Offer lots of physical affection...but pay attention to what your baby likes and dislikes. As noted above, nurturing touch appears to protect babies from harmful stress, and researchers think they know why. Affectionate physical contact triggers the release of several stress-busting chemicals in the brain, including oxytocin (the so-called “love hormone") and endogenous opioids (natural painkillers). These have a calming effect, and help switch off the production of cortisol. As a result, there is less physiological wear-and-tear on the body, and the brain is more likely to develop a long-term pattern of resilience to stress. But there is something crucial to keep in mind: Touch can also be irritating, creepy, or overwhelming. For instance, experiments suggest that many young babies don’t like the sensation of a light caress (Kida and Shinohara 2013). They might prefer a more firm sort of touch. Babies may also find it stressful to be touched in isolation, outside the context of a friendly, multi-sensory interaction. In experiments on newborns, infants showed a drop in cortisol levels when they were stroked by a caregiver who rocked them, made eye contact, and spoke soothingly. But when they were stroked in silence --without rocking or eye contact – these babies experienced a cortisol surge (White-Traut et al 2009). So we should adapt our approach to the preferences of the baby, and sometimes that means backing off altogether. Occasionally babies feel over-stimulated and need to withdraw, and we can cause stress if we don’t respect their wishes. 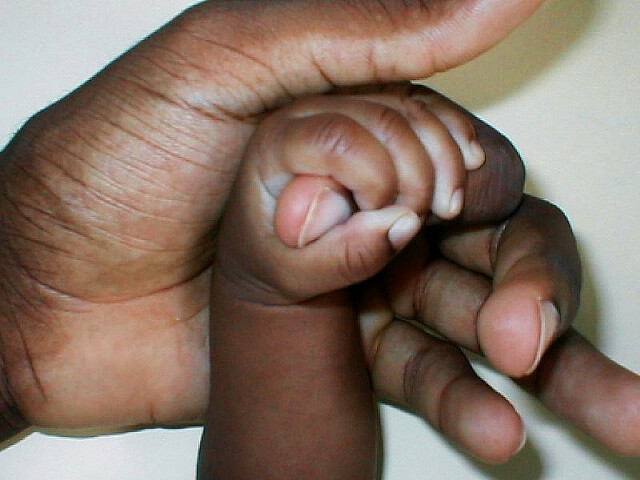 In one study, researchers watched mothers and infants as they played together, and noted whether or not mothers heeded their babies’ signals about being touched. Babies who received unwanted stimulation had higher cortisol levels (Feldman et al 2010). It’s hard to imagine. When is the last time you found yourself vulnerable, dependent, immobilized, and unable to communicate with language? But the better you understand your baby’s perspective, the better your chances of minimizing stress. For example, take bath time. Do you prepare everything first, and then undress the baby just before putting him in the water? Or do you undress the baby first, and make him wait for his bath? Amie Hane and Lauren Philbrook (2012) note what might go wrong in the latter case: The parent tries to hold the baby in one arm while she readies the bath with the other, but the baby is cold. So he cries and squirms, making it hard for his mother to hold onto him. When the water is ready, she releases the baby awkwardly, plunking him in the water more abruptly than she intended. The water feels particularly warm against the baby’s skin, and he screams in outrage. Thus, one misstep – allowing the baby to get cold– might lead to a lot of unnecessary strife for everyone. And, say Hane and Philbrook, little episodes like this might push families in the wrong direction. Because the baby seems so temperamental and intolerant of change, the parent decides to handle these situations by becoming more brusque and controlling. It’s going to be miserable, so why not get it over with quickly? But forcing the matter ensures that the encounter will be stressful, and creates a vicious circle of bad feelings--one calculated to turn childcare into a series of conflicts. Perhaps, then, we can avert a whole cascade of negative effects by figuring out what sets our babies off, and changing our tactics. If your baby’s irritation has you stumped, try asking an experienced helper for advice. You might be too stressed to see things objectively. And take heart: Making the effort to understand your baby's point of view may lead to many benefits. Studies suggest that parents who tune in end up with stronger attachment relationships -- and with babies who develop better social skills. Read more about it in my article on "mind-minded parenting." 3. Don’t underestimate your baby’s ability to read – and mirror – your negative emotions. When you’re distracted, upset, or depressed, you might think your baby doesn’t notice. But research suggests otherwise. Babies exposed to the sights or sounds of angry, bickering adults are more likely to develop abnormal stress response systems (Towe-Goodman et al 2012; Graham et al 2013). Moreover, a compelling experiment hints that babies can tell when we feel stressed, even when it’s about something that doesn’t concern them. Researchers temporarily separated mothers from their infants and then asked the mothers to perform a public speaking task. Some mothers completed a version of the task that was particularly stressful; others were assigned an easier job. When the mothers were reunited with the babies, the researchers measured everyone’s stress responses. The results? Infants in the high-stress condition mirrored their mothers’ stress reactivity, paralleling changes in heart rate and showing more anxiety towards other people (Waters et al 2014). The takeaway lesson may be this: Managing your own stress – by seeking social support or other remedies – could make an important difference to your baby’s behavior and well-being. 4. Engage your baby in one-on-one communication, but don't force it. Like physical affection, friendly talk and sympathetic body language can trigger our brains to release “feel good" chemicals, like oxytocin. Moreover, studies reveal that babies benefit when we treat them as conversation partners--acknowledging their feelings, responding to their implied questions, and offering them support when they are distressed. Not only do these tactics teach babies cope with their negative emotions, they also help babies develop secure, healthy attachment relationships. But once again, we need to be careful about the context. Just as babies can become stressed by physical touch, they can be overwhelmed by face-to-face communication. If your face is too close, or your baby has simply had enough “conversation," she will let you know. She may duck or put her hands over her face. She may try to turn her head and look away (Beebe et al 2010). It’s old wisdom supported by recent science: Babies like to be carried around, and seem to find it more soothing than being held by a person who doesn’t move. In a series of experiments, researchers found that infants experienced slower heart rates, reduced body movement, and reduced crying when they were held by an adult who was walking from place to place (Esposito et al 2013). 6. Make yourself emotionally available at bedtime. For most of human history, our ancestors slept close to their babies, and an infant’s survival depended on staying near. So it shouldn’t surprise us that babies find it stressful to be left alone in the dark. Indeed, there is evidence that babies experience elevated cortisol levels in this situation – even if they have been “trained" to sleep in their own rooms, and remain relatively quiet (Middlemiss et al 2011). But our nighttime sleeping arrangements don’t just affect the stress babies feel at night. They also may affect how babies handle stress at other times. For instance, when researchers subjected 12-month-old babies to a social stressor – the so-called “strange situation" – they found that infants varied depending on their personal histories. Babies who had spent more weeks “rooming in" with their parents experienced less cortisol reactivity, even after controlling for other factors, like parental sensitivity and attachment security (Beijers et al 2013). Another study reports that 5-week-old infants with a history of co-sleeping showed evidence of greater calm. While co-sleeping history had no apparent effect on the babies’ responses to a painful vaccination, it was linked with less cortisol reactivity during bath time (Tollenaar et al 2012). So being physically close at night may help babies regulate their stress responses throughout the day. But physical proximity isn’t the whole story. Some researchers argue that the crucial ingredient is emotional availability at bedtime – a characteristic that depends on a variety of behaviors. Do you use quiet, soothing routines to help your baby fall asleep at night? Do you avoid initiating social interactions with your baby as she approaches sleep? Is your manner free of any hostility or irritation? Do you respond promptly (within a minute) when your baby cries out in distress? When Lauren Philbrook and her colleagues observed the normal nighttime routines of families with young babies, they found that mothers who were rated as highly “emotionally available" were more likely to have babies with low nighttime cortisol levels. In addition, these babies were also more likely to develop normal, healthy patterns of hormonal change over the 24-hour day (Philbrook et al 2014). For more evidence-based information about infants, see my collection of Parenting Science articles about babies. To read more about the effects of parenting on a child's developing stress response system, see my Parenting Science article, "The health benefits of sensitive, responsive parenting." Looking for help with infant sleep? See these evidence-based articles on understanding and trouble-shooting baby sleep problems. In addition, if you know a highly reactive or "difficult" baby, be sure to read my post discussing the importance of alleviating stress in babies with very sensitive temperaments. For a discussion of cultural biases against taking babies' distress seriously, see my blog post, "Babies can't remember is bunk." And to access my collection of Parenting Science articles about babies, including evidence-based information about excessive infant crying, click here. Albers EM, Riksen-Walraven JM, Sweep FC, and de Weerth C. 2008. Maternal behavior predicts infant cortisol recovery from a mild everyday stressor. J Child Psychol Psychiatry 49(1):97-103. Asok A, Bernard K, Roth TL, Rosen JB, and Dozier M. 2013. Parental responsiveness moderates the association between early-life stress and reduced telomere length. Dev Psychopathol. 25(3):577-85. Beatrice Beebe, Joseph Jaffe, Sara Markese, Karen Buck, Henian Chen, et al. 2010. The Origins of 12-Month Attachment: A Microanalysis of 4-Month Mother-Infant Interaction. Attach Hum Dev. 12(0): 3–141. Beijers R, Riksen-Walraven JM, and de Weerth C. 2013. Cortisol regulation in 12-month-old human infants: associations with the infants' early history of breastfeeding and co-sleeping. Stress 16(3):267-77. Blair C, Granger D, Willoughby M, Kivlighan K. 2006. Maternal sensitivity is related to hypothalamic-pituitary-adrenal axis stress reactivity and regulation in response to emotion challenge in 6-month-old infants. Ann N Y Acad Sci. 1094:263-7. Esposito G, Yoshida S, Ohnishi R, Tsuneoka Y, Rostagno Mdel C, Yokota S, Okabe S, Kamiya K, Hoshino M, Shimizu M, Venuti P, Kikusui T, Kato T, Kuroda KO. 2013. Infant calming responses during maternal carrying in humans and mice. Current Biology 23(9):739-45. Graham AM, Fisher PA, and Pfeifer JH. 2012. What sleeping babies hear: a functional MRI study of interparental conflict and infants' emotion processing. Psychological Science 24(5):782-789. Gray L, Watt L, Blass EM. Skin-to-skin contact is analgesic in healthy newborns. Pediatrics 105(1): e14. Hane AA and Philbrook LE. 2012. Beyond licking and grooming: Maternal regulation of infant stress in the context of routine care. Parenting: Science and Practice 12:2-3, 144-153. Jansen J, Beijers R, Riksen-Walraven M, de Weerth C. Does maternal care-giving behavior modulate the cortisol response to an acute stressor in 5-week-old human infants? Stress. 13(6):491-7. Kida T and Shinohara K. 2013. Gentle touch activates the prefrontal cortex in infancy: an NIRS study. Neurosci Lett. 541:63-6. Kojima S, Stewart RA, Demas GE, and Alberts JR. 2012. Maternal contact differentially modulates central and peripheral oxytocin in rat pups during a brief regime of mother-pup interaction that induces a filial huddling preference. J Neuroendocrinol. 24(5):831-40. Mesman J, IJzendoorn MH van, and Bakermans-Kranenburg MJ. 2009. The many faces of the still-face paradigm: A review and meta-analysis. Developmental Review 29: 120-162. Mezzacappa ES and Katlin ES. 2002. Breast-feeding is associated with reduced perceived stress and negative mood in mothers. Health Psychology 21(2):187-93. Middlemiss W, Granger DA, Goldberg WA, Nathans L. 2011. Asynchrony of mother-infant hypothalamic-pituitary-adrenal axis activity following extinction of infant crying responses induced during the transition to sleep. Early Hum Dev. 88(4):227-32. Moore GA. 2009. Infants' and mothers' vagal reactivity in response to anger. J Child Psychol Psychiatry 50(11):1392-400. Mörelius E, Hellström-Westas L, Carlén C, Norman E, and Nelson N. 2006. Is a nappy change stressful to neonates? Early Hum Dev. 82(10):669-76. Philbrook LE, Hozella AC, Kim BR, Jian N, Shimizu M, Teti DM. 2014. Maternal emotional availability at bedtime and infant cortisol at 1 and 3 months. Early Hum Dev. 90(10):595-605. Roth TL and Sullivan RM. 2006. Examining the role of endogenous opioids in learned odor-stroke associations in infant rats. Dev Psychobiol. 48(1):71-8. Sharp H, Pickles A, Meaney M, Marshall K, Tibu F, and Hill J. 2012. Frequency of Infant Stroking Reported by Mothers Moderates the Effect of Prenatal Depression on Infant Behavioural and Physiological Outcomes. PLoS ONE 7(10): e45446. Sharp H, Hill J, Hellier J, NS Pickles A. 2014. Maternal antenatal anxiety, postnatal stroking and emotional problems in children: outcomes predicted from pre- and postnatal programming hypotheses. Psychol Med. 28:1-15. Shah PS, Herbozo C, Aliwalas LL, Shah VS. 2012. Breastfeeding or breast milk for procedural pain in neonates. Cochrane Database Syst Rev. 2012 Dec 12;12:CD004950. Stock S and Uvnäs-Moberg K. 1998. Increased plasma levels of oxytocin in response to afferent electrical stimulation of the sciatic and vagal nerves and in response to touch and pinch in anaesthetized rats. Acta Physiol Scand.132(1):29-34. Tollenaar MS, Beijers R, Jansen J, Riksen-Walraven JM, and de Weerth C. 2012. Solitary sleeping in young infants is associated with heightened cortisol reactivity to a bathing session but not to a vaccination. Psychoneuroendocrinology. 37(2):167-77. Towe-Goodman NR, Stifter CA, Mills-Koonce WR, Granger DA and Family Life Project Key Investigators. 2012. Interparental aggression and infant patterns of adrenocortical and behavioral stress responses. Dev Psychobiol. 54(7):685-99. Tu MT, Lupien SJ, and Walker CD. 2006. Multiparity reveals the blunting effect of breastfeeding on physiological reactivity to psychological stress. J Neuroendocrinol. 18(7):494-503. Underdown A, Barlow J, Chung V, and Stewart-Brown S. 2006. Massage intervention for promoting mental and physical health in infants aged under six months. Cochrane Database Syst Rev. 18;(4):CD005038. Waters SF, West TV, Mendes WB. 2014. Stress contagion: physiological covariation between mothers and infants. Psychol Sci. 25(4):934-42. Weller A and Feldman R. 2003. Emotion regulation and touch in infants: the role of cholecystokinin and opioids. Peptides 24(5):779-88. White-Traut RC, Schwertz D, McFarlin B, and Kogan J. 2009. Salivary cortisol and behavioral state responses of healthy newborn infants to tactile-only and multisensory interventions. J Obstet Gynecol Neonatal Nurs. 38(1):22-34. Yoo K and Reeb-Sutherland BC. 2013. Effects of negative temperament on 5-month-old infants' behavior during the still-face paradigm. Infant Behav Dev. 36(3):344-8. Zotter H, Urlesberger B, Pichler G, Mueller W, and Kerbl R. 2007. Do wet diapers induce arousals in sleeping infants? Acta Paediatr. 96(3):452-3. Portions of the text are derived from an earlier article by the same title.